When John Bercow broke his promise about quitting after nine years as the Speaker, his officials said he wanted to stay on to 'see through Brexit'. While he didn't address the subject publicly himself, his friends wanted it known that he was not trying to thwart Britain's departure from the EU, but simply felt 'very strongly that there must be parliamentary scrutiny' of the process. However, it was universally recognised by long-time Bercow-watchers that he was on a one-man mission to delay or scupper Brexit altogether. For the Speaker has made no secret of his disdain for Brexit and flaunted his contempt for it. 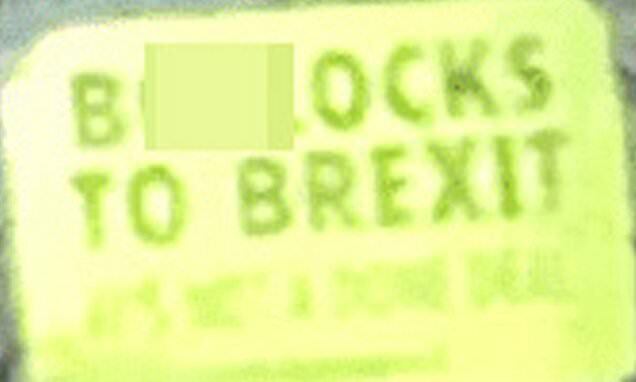 Most notoriously, a bright-yellow 'Bo***cks to Brexit' sticker was spotted on the windscreen of a car parked outside his official residence – which he said belonged to his wife. Most people in Westminster believed he sympathised with the slogan, particularly since he was recorded at about the same time last year telling students: 'I thought it was better to stay in the EU than not.' To the same audience at Reading University, he spoke about what he called 'untruths' about the pro-Brexit campaign and 'promises that were made that could not be kept'. By convention going back centuries, the Speaker is supposed to stay above the party political fray. But, most notably, he has chided Labour for not doing more to win the referendum and for not 'striking a very clear resonant Remain note'. The truth is that during his almost ten years as Speaker, the 56-year-old taxi driver's son has shamefully degraded the reputation of the Commons. He was elected in the wake of the MPs' expenses scandal and it was hoped that there would be a new era of rectitude in the Commons.